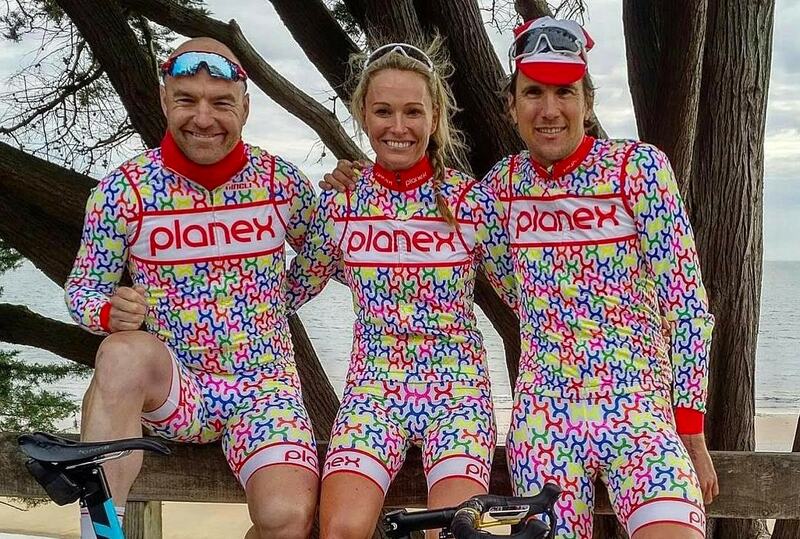 If you’re in the Melbourne cycling scene there’s a fair chance you’ve come across the St Kilda Cycling Club President, Lee Turner (pictured to the far right above, with partner Alison McCormack & teammate Tommy Nankervis) . Whether it’s his wardrobe of eye tantalising cycling outfits, or his distinctive voice echoing throughout one of Melbourne’s many bunch rides, this magnetic character known as “Hollywood” is full of life and well-tuned to all things cycling. Lee has had more than ten years of intimate exposure to Melbourne’s illustrious cycling community – the last three of those years as President at the St Kilda Cycling Club. We recently sat down with Lee to get his thoughts on Melbourne cycling and what lies ahead. Lee talks about a recent crash he had at the Shimano Super Crit at the backend of 2017. He crashed on the fourth corner after someone went down in front of him. He broke both his wrists and then bounced into the gutter where he smashed them again. After the crash Lee was on some very heavy medication and was in a dark place for some time. Having the support of his partner Al and friends helped him get through a tough period of his life. Lee speaks about joining St Kilda Cycling Club in their second year when Mike English was the President. Lee sought advice from friends about which club to join. They said SKCC was a bunch of chardonnay sipping, café hopping, show boaters. Lee was sold from that conversation onwards. Lee talks about “playing dress-ups” as one of the reasons he fell in love with cycling. Every day he can put on something different, with 120 kits in his wardrobe! He still has cycling kits in packets that have never been opened. Lee talks about how Stitch and Dark (local Melbourne cycling team) came about. He then goes on to explain how A grade superstar Tommy Nankervis helped him to his first A grade win. Lee hit the break pretty much from the gun and in a fatigued state Tommy led him to victory. Lee talks about how the Stay True cycling team came together. Lee and his mates looked up to 02 Racing as they were constantly winning A grade down at St Kilda. Lee talks about his favourite bunch rides – North Road Long and Hell Ride. He says Hell Ride is a ride he feels safe in because he knows the guys around him. He calls it the eye of the storm. The further you go back the worse it gets. It’s also not like the old days where riders used to run red lights. Lee sees the police presence as a positive, which ultimately helps stop riders running traffic lights. Lee talks about the abuse he gets every week from drivers. He thinks the best thing Vic Roads could do is an advertising campaign educating motorists that cyclists riding two abreast is legal. Lee spent 3 years as the Communications Manager at St Kilda Cycling Club, and then he started to fall away from the cycling club a little, at least in official duties. A new club started forming (Melbourne Cycling League) and Lee was being enticed to join. Then he started to think about St Kilda and the loyalty he had to the club, so he decided to get more involved in SKCC again which led him to the presidency. Lee describes Melbourne Cycling League as a bottle of champagne – it pops and fizzles for a while but then dies down and nothing happens. Lee describes him and the team taking SKCC in 2014 from a $54k loss to a $30k profit the next year, “with a bunch of passionate people that got stuff done”. Lee talks about Gaelene Snelling and how passionate she is about the club. She’s behind the scenes doing all the hard work, according to Lee. Lee talks about the Shimano Super Crit as being his most proud achievement. When Lee came onboard as president it wasn’t going to happen so he rallied some key people, they got together to brainstorm, won Shimano as a major sponsor, and now it has grown year on year. Lee is also proud of the walls that have been broken down between some of the big enemies, such as Caulfield Carnegie Cycling Club. Bringing other clubs together to run events has been a real highlight. The biggest challenge for St Kilda moving forward is the crit course. They have been working on the next crit course for the past 7 years. They’ve put in a submission for Fishermen’s Bend which is looking promising. Lee talks about the best criterium racer in Melbourne and the hardest criterium course. We finish the conversation with cycling fashion – only wearing black bibs is a complete myth. We all should have proper sock length, matching bibs and jersey, sunglasses over your straps. If you’re interested in reading more about Lee, check out our previously published article here. Thanks for the feedback Tim. We really appreciate it. We’ll look into the issue this week. G’day Cameron. Similar to the previous comment the iTunes link doesn’t seem to update the podcasts either. Thx for the great interviews mate.